Without strategy, no results. This applies in particular to digital signage campaigns. Too often, the distribution strategy does not take into account all the optimization parameters, both at the level of the content itself and at the level of the distribution media: the screen. Here are the questions to ask for a content that's always high quality and highlighted! What is the strategic objective? Is it about increasing your brand awareness? Changing your brand image? Are you looking to retain your customers or awaken prospects? Do you want to talk about your brand, your product or service offers? A promotion? Answering the question of the purpose of the communication helps to better construct the message. If these elements are clear to you, they may not be clear to the creative person in charge of building your campaign. It is important to focus on the creative brief: in addition to clearly expressing the objective of the communication, specifying the constraints of its media is essential. The content of the screens depend on technical constraints as simple as orientation and audience (moving in front of a window, or waiting at the checkout for example). Is the message consistent with seasonal patterns? What are the rush hours? Time of day? The context (your news, that of your competitors)? To guarantee a good deliverability of your message and a better memorization of it, it is necessary to answer these questions. Take into account your target's environment when it is in contact with the display screen: it can be as different as the time of year, news, weather or even broadcast schedules. It will be more appropriate to broadcast a video for a refreshing drink on a sunny afternoon. While this example may seem crude, it nevertheless reflects a certain reality. On the contrary, campaigns can be contextualised when they are set up, but independent events can disrupt their relevance: it is necessary to be able to quickly readjust its content or review the parameters for its distribution. The advantage of Content Management Systems (CMS) dedicated to digital signage is that the content can be controlled in real time. Where is the screen in the customer's path? In what "state" is the audience at the time the message is broadcasted? How long will the audience be in contact with the message? What will the exposure/ brightness of the screen be? The question of the location is crucial for the creation of the campaign: positioning the screen correctly is crucial. (Read our 5 tips to position your digital signage screens in the best possible way) The "location" can be defined by the position of the screen in space, as well as its place in the audience's path. It is then a matter of adapting the content to the intellectual availability of the audience: the length of time the video or image is broadcasted or its interactive nature. Reading ergonomics must be optimized: while the screen's exposure will determine its brightness parameters and the colors chosen, its position in space will determine the content background. Ensure maximum deliverability of your messages by building a strategy around your content, background and target environment. And...objectives met! 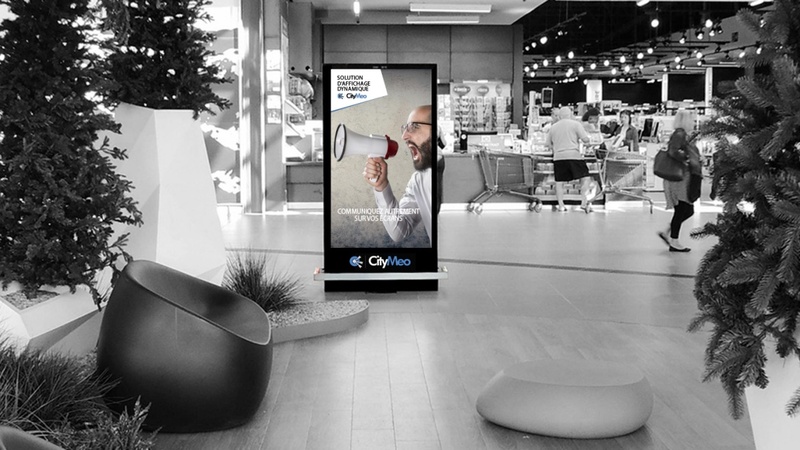 CityMeo offers a digital signage solution with powerful features, but yet is extremely easy to use.